In our series of letters from African journalists, media and communications trainer Joseph Warungu reflects on gender inequality in Kenyan politics. The Kenyan parliament is a tough playground. And just like any other playground, the bigger ones tend to play rough and keep the toys to themselves. The "boys" in parliament have been doing exactly that, by refusing to share their play area and their toys - or their seats and their political power. For eight years, women have been pushing for a bigger role in politics through the enactment of a law that would fulfil the requirements of the 2010 constitution, which states that "not more than two-thirds of the members of elective public bodies shall be of the same gender". But the latest attempt to pass the bill has failed, and now the "boys" and "girls" have gone home on a long holiday, stretching to February. Gone too is the opportunity - at least for now - to reform the playground, meaning Kenya's parliament continues to lag behind other East African countries in terms of gender balance. In Rwanda, more than 61% of MPs are women; in Tanzania it is 37%, while the figure for Uganda is 34%. In Kenya only 22% of legislators are women. In order to satisfy the requirements of the two-thirds gender rule, 42 new female MPs would need to be nominated, raising the total number of legislators from 349 to 391. Some Kenyans fear that in a country with some of the most highly paid MPs in the world, an enlarged national assembly will mean an additional tax burden. Others are afraid that they will lose the right to decide who represents them if political parties assume the role of nominating the additional female MPs. In holding on to their toys, some male MPs have expressed the fear that the calibre of female leaders will be compromised by political parties' use of dubious nomination criteria. But paradoxically, this issue has never been raised when it comes to nominating male MPs. The playing field is clearly not level. Given past difficulties in pushing through the gender bill, many had expected President Uhuru Kenyatta, his deputy William Ruto, and former Prime Minister Raila Odinga - who now leads the main opposition grouping - to read the riot act to their MPs. These national leaders have in the past joined forces and whipped parliamentarians into line when they cared enough about a particular bill in the national assembly. An example was a recent successful move by the president - with support from Mr Odinga - to push through new tax measures that were unpopular with MPs and the public. Here though, the president and his deputy have taken a softer approach - dropping the stick in favour of the carrot - by presenting the gender bill as a historic opportunity. Before an attempt to pass the bill in 2016, President Kenyatta said: "I call upon all our members to vote for this bill... the people of Kenya are waiting to see you make history this afternoon". But the plea fell on deaf ears as the bill was not passed because of a lack of quorum. "You male MPs should be the last to stand in the way of our mothers and daughters." But the MPs did not budge, turning their backs on history. While proponents of the gender bill were focused on getting it passed, many of the MPs were distracted by another bill that spoke directly to their stomachs. Called the Parliamentary Service Bill, it will, if passed, increase the MPs' benefits. In addition to their hefty salaries and other generous perks, they will be entitled to a second car maintained by the taxpayer, a house or generous housing allowance, and a fund to help them monitor government projects. In addition, the MPs want the bar and canteen in the parliamentary complex to be at the level of a five-star hotel. The MPs know that the president is not in favour of this bill and has threatened to reject it, arguing that the legislators should be sensitive to the needs of ordinary Kenyans. So privately many of the MPs have offered a deal: "Approve our stomach bill and we'll approve your gender bill." But such a deal may not be something the president and his deputy can stomach. Finally, the march to gender equality has also been held back by poor mobilisation of grassroots support. Ambitious and well-educated women in the workplace are not afraid to demand their rights. But for many women, especially those living outside the city, their focus is on survival. With corruption eating deep into the fabric of Kenyan society and the cost of living as high as ever, they are too busy struggling to stay afloat to have much time for the gender debate. But their mobilisation could also have helped counter the lame excuses that have propped up the status quo, such as the comment by a male MP who reportedly said: "Men and women are equal under the constitution, so let women fight for themselves just like men!" 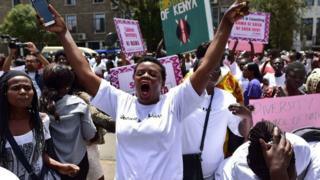 The Kenya Women Parliamentary Association (KEWOPA) has been working hard to garner support for the gender bill. Many other organisations have also lent a hand, but a lot more needs to be done. Before the 2017 general election, I worked with the experts at the National Democratic Institute, a US-based non-profit group operating in Kenya, to help equip the new women candidates and youth aspirants with media, communication and other skills. A number of the aspirants were successful. So what more can be done to make the gender bill a reality and increase women's participation in political decision-making? Firstly, when parliament revisits the bill in February, it must be backed by a sustained and robust campaign by politicians and civil society - like the one that led to the repeal of an article protecting one-party rule in the old constitution. Secondly, political parties must be pushed to declare safe seats for women. This move has succeeded in other democracies, and it can succeed here. Thirdly, women must be encouraged to compete in elections - because it works. In the 2013 general election, when the devolved system of government was introduced for the first time, not a single woman was elected governor to lead any of Kenya's 47 county governments. Today there are three women governors who successfully fought off strong competition from well-established male politicians. From zero women senators in 2013, there are now three elected women senators. And in the national assembly, the number of elected women rose from 16 in 2013 to the current 22 elected in 2017. In addition, the second-longest serving elected MP in Kenya is a woman. Naomi Shaban has been elected to parliament four times since 2002. The boys in parliament may have taken their toys home for the holiday - but they should be prepared to share when they come back.